At STEM for Kids we strive to engage campers in the various applications of STEM while giving them a unique, industry perspective. Thanks to the to NASA Solar System Ambassador program, we are able to go above and beyond our normal business mindset. Solar System Ambassador, Marc Fusco. Raleigh's new 2013 Ambassador, Marc Fusco will be coming to STEM for Kids' North Raleigh location next week during our robotics camp to talk to campers about space technology and help them understand the applications of robots in space exploration. We are very excited to have Mr. Fusco with us next week and even more excited about giving our kids this type of opportunity. Fusco will be speaking sometime next week (July 29-Aug. 2) in our North Raleigh Location at our Robotics camp. More details to come. 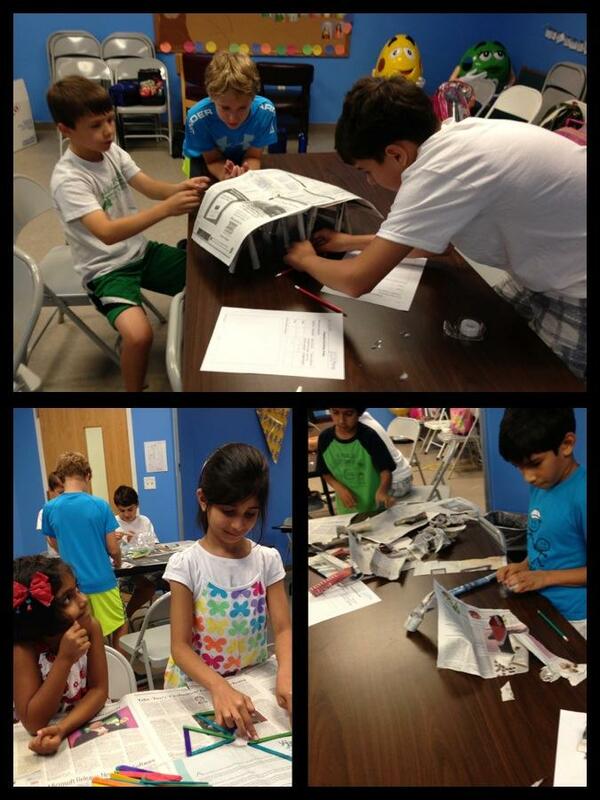 Campers in Cary's Civil Engineering Camp collaborating on building weight bearing, newspaper bridges. As we have hit the ground running this summer, I had suggested SFK start a STEM Coach blog posting. This could be a way for parents to get a brief recap of the topics covered in their child's week while also getting some feedback and opinion from the coaches. This week I was exploring "strong and stable" structures in Cary's Civil Engineering Camp. Throughout the week, we had campers from all grade levels determining the definition of "strong and stable." Campers learned the concept of gravity and its effect on the buildings they see every day, as well as the impact various shapes have on civil structures. Using this same understanding, campers saw different examples of bridges and how they work. Some of the different projects included building truss bridges, constructing skyscrapers on a budget, and crafting bridges out of newspaper. These hands-on activities reinforce how shapes and various forces impact different structures. If you don't believe me, I had a parent come in one morning and tell me that their child had explained to them while driving into camp that truss bridges are "strong and stable, because the triangles used to build them." But putting the formal learning aside, campers engaged in an even more important skill--collaboration. Throughout the week campers had to work together in group to construct their structures. This gives them all a common goal and interest. When this happens campers (on their own) begin communicating with their peers about relevant civil engineer topics. From there the conversations expand to the structures they see everyday. An important common core standard being emphasized to educators is the ability for their students to discuss "relevant topics" in whatever grade level they are in. That is exactly what transpired during this week of camp. Pre-schoolers talking with fourth graders about the way arch bridge distribute weight is a very weird conversation to overhear. However, it demonstrated their understanding. On the end of the week surveys each camper takes, many of them commented that they enjoyed "making new friends," or learned "how to make friends." This networking component made this camp even more relevant to campers' lives. So after many hot glue gun experiences (solely on my part), campers left with a better appreciation of the structures around them as well as the importance to communicate and work together.